Jake's plan for a carefree holiday at a musical performing arts camp in the Windy City hits a sour note when he stumbles upon a long-hidden message from his late mother, art historian Karen McGreevy. 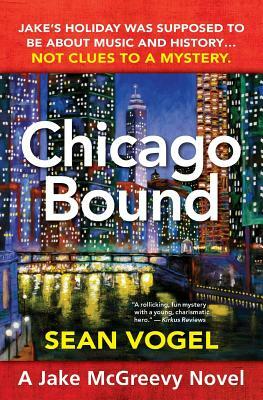 She had traveled to Chicago thirteen years earlier on a dream assignment, never to return home. With his violin and his mother's mysterious letter in hand, Jake, his best friend Julie, and new pals Ben and Natalie are heading west, where they will follow the clues and uncover the truth about a missing masterpiece, the meaning of friendship, and the enduring bond between a mother and her son. Growing up in a small town in Michigan during the 1980s, Sean Vogel was provided with an excellent garden for cultivating his writing career. With only a few simplistic video games and three television channels, he became an accomplished daydreamer and a creative outside adventurer. A son of a garbage truck driver, Sean often received gently used items from his father's route. With a bit of imagination and a little tinkering, these items were reborn as tools for battles against backyard bandits. These childhood experiences would later serve as the foundation and inspiration for Jake McGreevy's gadgetry expertise. Seeking his own adventures, Sean joined the Army via an ROTC scholarship at Colorado State University. Living in Germany for several years gave him the opportunity to travel extensively in Europe. During his time in the Army, he served in the Field Artillery and Signal Corp, rising to the rank of Captain and receiving the Bronze Star Medal for his service in Iraq. Sean started drafting novels during downtime while stationed in Iraq; a pen is easier to carry than a guitar. But he soon fell in love with the frustrating yet satisfying science called writing and has been hard at work ever since. When he's not helping Jake get out of tangles, Sean is a department manager for a large aerospace company. He lives in Denver with his wife and daughter and their two dachshunds.